If you are looking for a display to which you can attach posters and other display material by using Velcro tabs then this is the one for you. Posters just cling on and then peel off when you are finished. 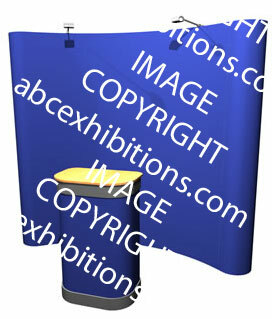 Banner stand style option. We have straight and curved options in all sizes. Please ask if you do not see immediately see exactly what you need. We can mix printed and fabric panels as you wish. Standard loop nylon and Prelude fabric options available for this product. Pros: Light weight,one piece graphic. Doddle to set up and transport! Pros: great case-counter, can be enlarged, wheeled case easy to set up and transport!